I was at the Bats game in Louisville Monday night and let’s just say there was a lot of news. The details of the game were encouraging. Cody Reed pitched six innings of 1-run baseball and looked excellent for much of it. Lorenzen had a good inning of work and Jose Peraza reached base four times, breaking out of an extended slump. Media access means that I get to go a little deeper, though. 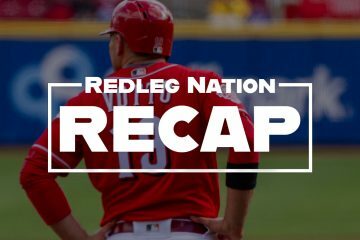 I spoke with Lorenzen, Bats manager Delino DeShields, and Cody Reed and each provided interesting information. Lorenzen topped out at 98 and sat at 96. He seemed to indicate he had more velocity, “That’s not going to be my ceiling.” DeShields also thought he looked. 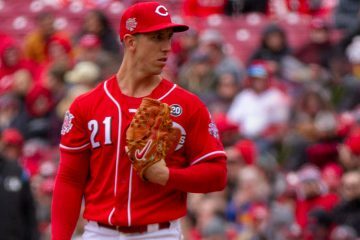 I happened to over hear Ted Power as I was leaving saying that over than “bouncing those first two curveballs, he was great… the same old Lorenzen.” Lorenzen, when speaking, seemed genuinely dedicated to helping the team in whatever way he can he said, “I know I can be a good major league starter,” but was also clear that he would pitch from the bullpen without complaint. Reed came out after receiving treatment for the ball off his leg. He reported that he felt fine except for the goose egg on his leg. Regarding his control, he said his control wasn’t how he wanted it and admitted to trying to aim the ball too much when he walked the pitcher on four pitches. Winker was asked about (he was removed from the game Sunday and didn’t play Monday. We were told he has a wrist injury that has been bothering him for a few days and had reached a point where he cannot hold a bat. He had an MRI Monday and it wasn’t known if it was related to his previous wrist injury from 2014. I continue to think that when he is called up, Reed will be the best pitcher on the staff. He does have his moments, but seems capable of correcting himself. When he is on, he is dominating, and I’m excited to see what he does against a major league lineup. I’ll try to keep you posted on Winker, hopefully the injury is not serious. What fantastic information. Thanks for the peek behind the curtain. Wright down, Hoover up, means the Reds will need a different starter in 5 days from last night. Reed pitched last night…… Naw that’s too obvious where the Reds are involved. I watched lefty Danny Duffy for KC just mow down the White Sox the other day and Reed sounds sort of similar although I haven’t seen him yet. I don’t know if Reed is throwing 96-98 like Duffy but just to have that kind of potential! There are so just so few lefties that throw that hard and it gives them a chance to snap that slider from way outside to righties and just snap it over like Chris Sale. It will interesting to see Reed develop…that’s for sure!! I think it’s between Stephenson or Reed as to who becomes the best pitcher on the staff over the next couple years, though I do think if he can stay healthy and stick in the rotation (which isn’t a sure thing), Iglesias could be a top-10 pitcher in the league. The interesting question here, with the roster moves, is if this is the permanent call-up of Peraza or is he sent back down when Billy is healthy? Pacheco was my guess to be dropped when Billy came back and Selsky/Waldrop have played well enough to deserve stay for now. I guess Selsky or Waldrop getting sent down is less important than Peraza staying up or not, but maybe De Jesus could possibly get DFA’d? The more I think about it, it sounds like this may be Peraza for good (Super Two in mid-late June?) and therefore it is between Selsky, Waldrop and De Jesus for Billy’s spot soon. Yeah, probably should be De Jesus but you never know with Reds. Peraza has a unique service time situation/ super2 situation because he had 42 days of MLB service time coming into 2016 then was up an additional 2 or 3 days during the interleague road series in Cleveland. He needs to stay under 172 days MLB time at season’s end to keep the Reds from “losing” a year of control over him. If i calculated correctly, he’s cleared that number. However those previous 45 MLB days also impact on super2. If he comes up now and stays up to the end of the season, he will be around 150-160 MLB days at year’s end which assuming he subsequently spends all of 2017 and 2018 in MLB (counting any MLB DL time) almost certainly makes him a Super2 after the 2018 season. He probably needs another month ( in total before the end of the 2016 season) in the minors to assure he is not on line for Super2 following the 2018 season. I don’t believe DeJesus can be moved off the 25 man roster without being exposed to waivers. Presuming Cozart is going to be traded or in the event of an injury before that, they would need him or someone like him on the active roster as the infield sub (back up SS). So, I don’t see DeJesus being DFA’d. Pacheco was in the spot typically held by a 2nd back up IF guy. Peraza is now in it, even if it is for the short term and if he is actually there as a back CF until BHam is back. JJ Hoover is back? Well I’ll be. He is out early on those arson charges. Out on good behavior. Those innings he set ablaze in April and early May are still smoldering. Hoover in the late innings. Matches, meet gasoline. He is out early on those arson charges. I just don’t see electric stuff with Stephenson? I saw him once last year live and twice this year on TV with the Reds. I think Lorenzen has better stuff but who knows? Inglesias needs a split or to develop a change or something vs lefties or he’ll never be a top notch pitcher? He’s rough on righties though and has been from day 1. He’ll give Price some mix-n-match options! I don’t have any first-hand knowledge at all, but it seems to me like Stephenson is throttling back, trying to gain command, and he’s losing life/velocity on his pitches. His strikeouts are way down, which is worrying. 6.85 K/9. He’s never been lower than 8.25 K/9 in the minors. And he only struck out a total of 4 in his 2 starts in Cincy. K-rate doesn’t fluctuate a lot. It very quickly approximates true talent. Stephenson not striking out as many batters is a bad sign. Interesting comments about Reed and his intensity.I like for a pitcher to show intensity on the mound but often when they do and don’t succeed they are told they must calm down some.If every guy that was intense calmed down and it made them a better player then by all means calm down but that has never been the case.I think its great to show us the fans you care as a professional athlete. I have liked Reed since watching him in spring training. He was throwing nasty stuff. I have not seen him since, hope he still has his stuff. Stevenson was good, in spring training, but did not have the stuff Reed had. If this is the same kind of issue with Winker’s wrist then his new arrival date is 2018. His power also may never really arrive. I see schebler has been on a tear.